Your bathroom has had a lot of extra traffic during the holiday season. 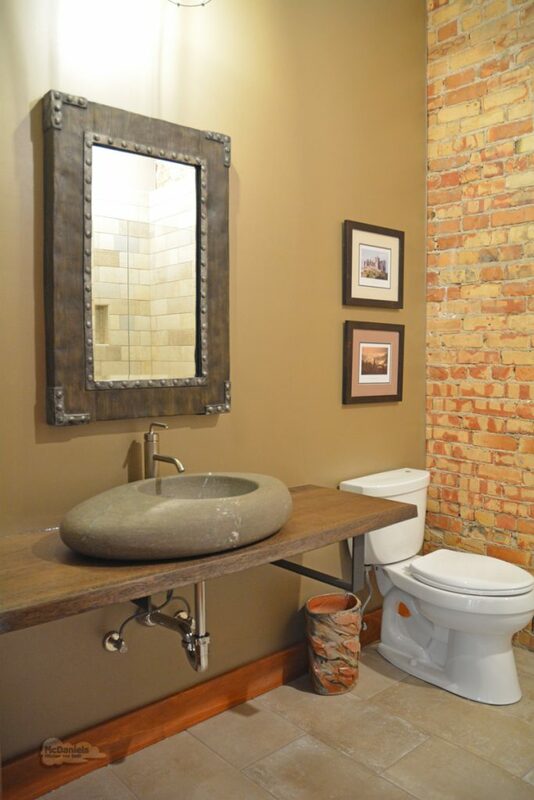 January is the perfect time to de-clutter and assess how your bathroom design holds up to daily use. 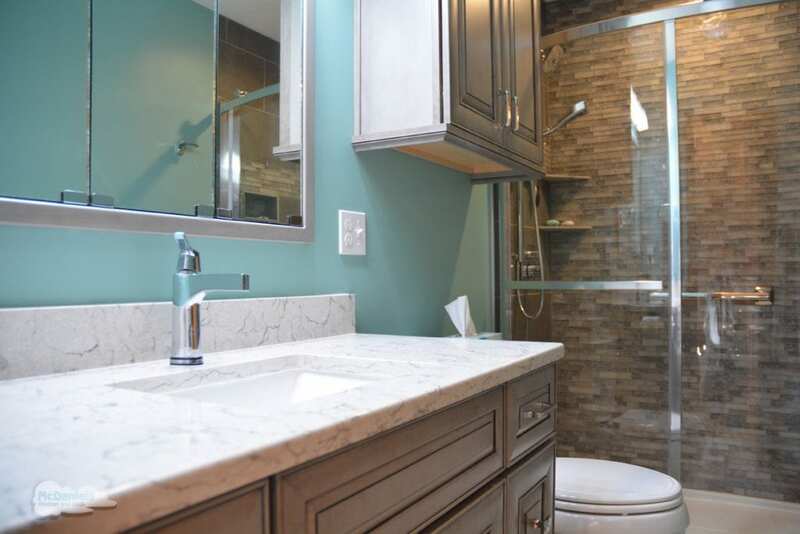 A bathroom remodel offers an opportunity to start afresh and plan what you need with a design that is easy to maintain. Whether vanity storage or countertop work space is your biggest challenge, read on to discover five easy steps to a clutter-free bathroom design. 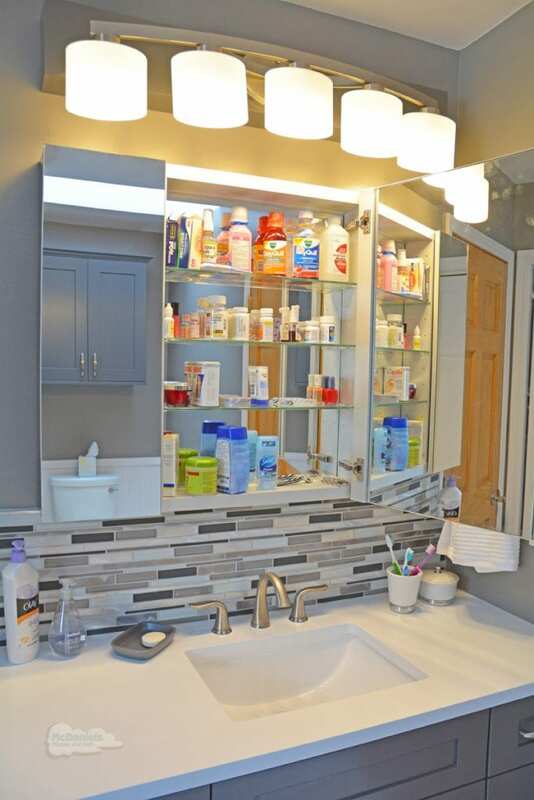 Whether you are just carrying out a New Year’s resolution to de-clutter or embarking on a bathroom renovation, pull out the contents of your vanity, medicine cabinet, and shower and survey what you have. Get rid of anything unused or out of date, decide what to keep, and then plan dedicated storage either in your existing cabinetry or with your bathroom design professional if you are planning a new design. Extra supplies of soap or toilet paper can go to the back of a bathroom cabinet or somewhere else in the house, like a hall closet or utility room. Keep essentials like soap and toothpaste by your sink, and other necessary items in customized storage drawers or pull outs. Any other items can be put in jars or baskets on open shelves, freeing up valuable counter space. If you have duplicated items, distribute them to other bathrooms and then use up toiletries before you buy more. 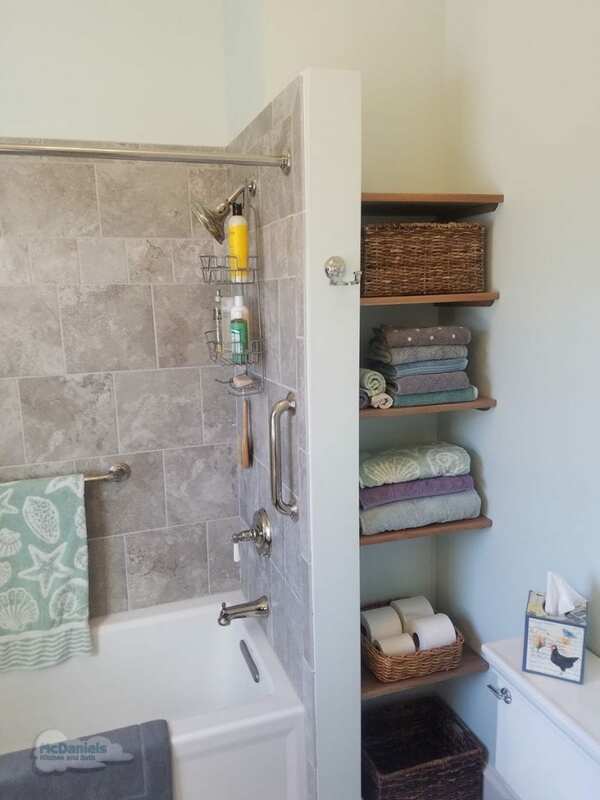 If you have towels everywhere, limit the towels in your bathroom to those you need now with perhaps a few extras that fit on a shelf or in the vanity. Make sure you include bars, hooks, or rings in locations convenient to the sink and shower, so you always have a place to hang up towels. Now that your countertops are as minimalist as possible, it’s time to store toiletries and cleaning products in a customized vanity cabinet. Pull-out laundry hampers, trash cans and inserts for beauty tools and products can all be included in your storage plan at the bathroom design stage. Add built-in laundry hampers so family members will never have an excuse to drop dirty clothes on the floor. Drawers (with internal dividers) or shelves can be labelled for each family member or categorized by their contents. Organize the medicine cabinet by family member or medicine too, remembering not to store anything moisture-sensitive in the bathroom. 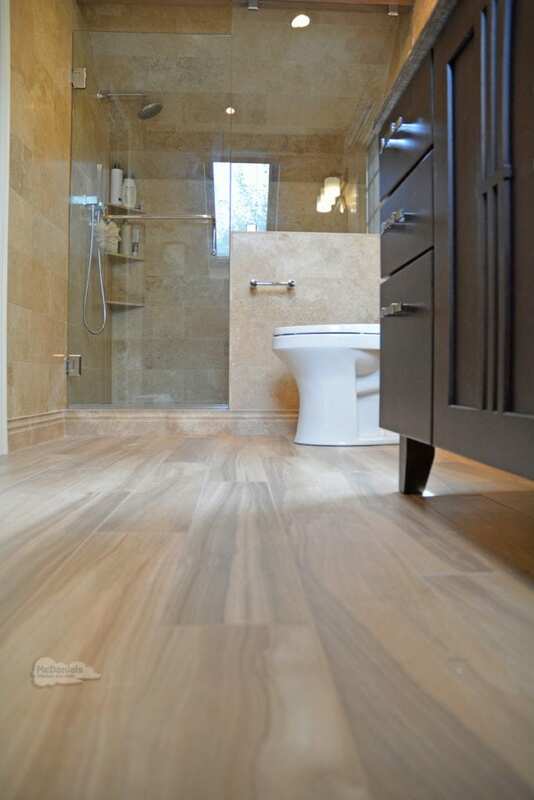 Often, bathrooms look messy because the floor is not only littered with towels and products, but vanities, toilets, baths and showers can take up floorspace. As well as keeping everything in customized storage, go for a wall hanging toilet, floating vanity or claw-foot bath to keep your floor clear. 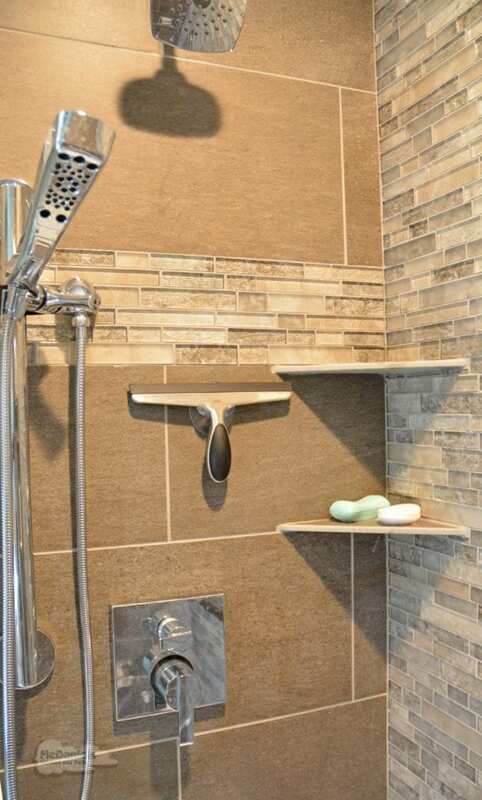 Easy-clean materials like large, non-porous tiles are a more maintenance friendly choice than mosaic ones, so keep the latter to a small feature area to make your life easier! Hooks, whether adhesive, screwed into the wall, or on a rack over the door, provide the perfect solution for hanging bathrobes, clothes, towels, and laundry bags. Why not hang a personalized storage tote for each family member? Towel bars and radiator style warmers are also perfect for keeping towels to hand. Niche and corner shelving are ideal for keeping toiletries neat and accessible. Another option is hanging a bucket from a shower rod for each person’s toiletries or bath toys. Showers are a large part of every bathroom design, but especially a small bathroom, and the shower impacts the whole room if it is dirty. The simpler the shower design, the easier it is to maintain. Open showers or frameless glass doors are a no-brainer to clean compared to metal framed doors. Keep cleaning products and tools handy and to give your fabulous new shower a quick wipe every day. Why not reward yourself by installing a shower seat to provide a spa atmosphere. Add candles and folded towels, so you can relax and enjoy your clutter-free space. Designing an easy-clean bathroom with the perfect storage solution for you has never been so easy. 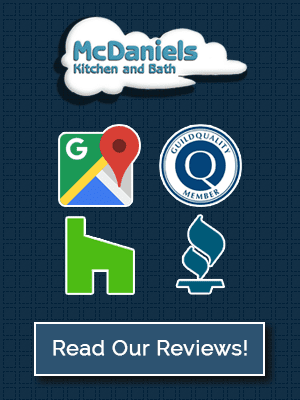 Check out our bathroom design gallery or contact us today to get started on a sleek, yet welcoming bath remodel.